Puppo! comes from Shumpei Hayashi. I'm a big fan of his other game Levels - Addictive Puzzle Game. The object of Puppo! 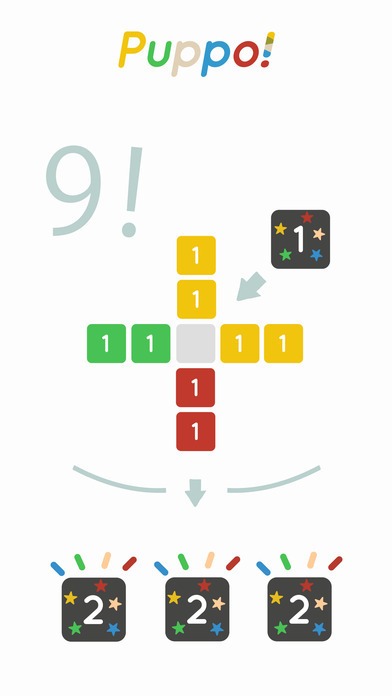 is to score points by placing three yellow 1's in a row. It will turn into a single yellow 2. At first I thought: oh, this is like Merged! and a slew of other games. Yes and no. The big difference is that when you get that single yellow 2, it comes off the board and you can place it anywhere you like. Another difference - the numbers with stars on them that act as wild cards. 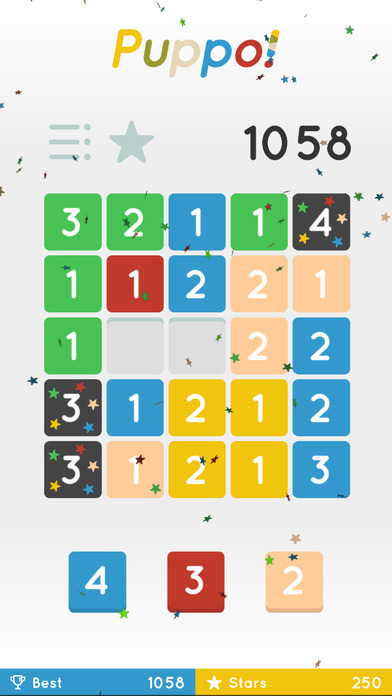 This is a very interesting point-scoring puzzle app game. My high score is 18,000 which places me in the top 50 out of 2000 players. They key to scoring high in this game is to get combos as seen in the second image. Also, it's possible to buy 'stars' which will turn some of your regular tiles into wild cards. Of course, that could explain how somebody got a score of 55,000.